A fun and fresh look at the fruits of the spirit. This characterful book includes adorable personified fruits, as well as scratch-and-sniff pages! God gave us lots of amazing gifts to help us follow him, and with the Cutie Fruities young children will discover what those gifts look (and smell!) like. 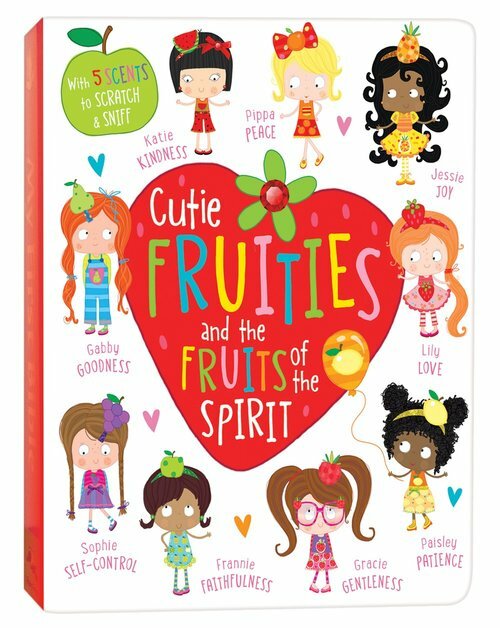 Written for ages 4-7, the delightful Cutie Fruities are a unique way of sharing the fruit of the spirit. Characters like Katie Kindness, Gracie Gentleness, and Jessie Joy each illustrate what it means to use the gifts God gave you. They are bright, told in pleasant rhyme, and even include sweet scratch-and-sniff pages that help children remember the fruit of the spirit. 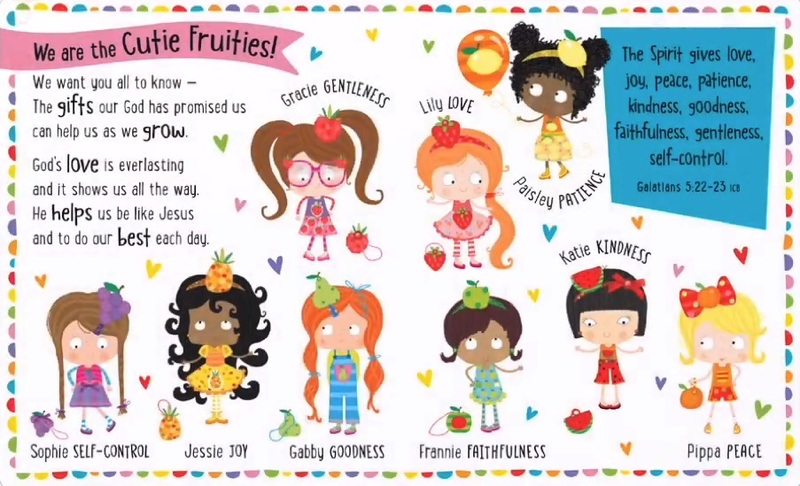 Each of these beautifully illustrated pages in Cutie Fruities and the Fruits of the Spirit is a fun lesson in knowing God’s gifts better. Learning to be more like Lily Love, Paisley Patience, of Pippi Peace will help young children learn to be more like Jesus above all. The fruits of the spirit have never smelt so sweet, nor been as memorable as they are in the scratch-and-sniff book. Perfect for Sunday Schools, rainy days, and storytimes. Cutie Fruities and the Fruits of the Spirit by Lara Ede was published by Authentic in June 2018 and is our 2822nd best seller. The ISBN for Cutie Fruities and the Fruits of the Spirit is 9781788930024. Be the first to review Cutie Fruities and the Fruits of the Spirit! Got a question? No problem! Just click here to ask us about Cutie Fruities and the Fruits of the Spirit. The Cutie Fruities are characters who introduce the Fruits of the Spirit in a fun and engaging way to young children. This beautifully illustrated story features nine girls, each of whom personifies a particular Fruit of the Spirit. With beautiful illustrations by Lara Ede and told in simple rhyme, this book will help young readers learn more about the gifts God has given them, and encourage them to demonstrate the Fruit of the Spirit in their own lives. Each cutie fruitie has a scratch and sniff element based on their 'fruit' to help young children remember the characters in a fun way. This is fun and sweet introduction to the Fruits of the Spirit for young children.